We’re sharing some of our favorite free sewing projects for the holidays each Friday until the end of the year – from decorations to deck the halls to quick gifts for loved ones. This week we’re sharing some of our favorite stitchable gifts for kids. Click back to see our favorite Deck The Halls For The Holidays projects, our top quilted and Pieced For The Holidays projects, and our favorite wearable projects fit for your “Festive Finery”. What could be cozier and cuter than a clever fox scarf? 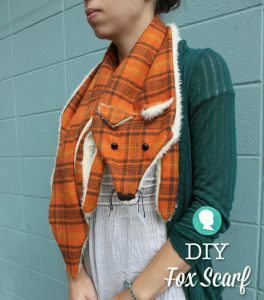 Get the how-to from the gals at Prudent Baby for the DIY Fox Scarf. Other great cozy gifts on our handmade gift list include Dana’s PJ Pants for Kids, Bettsy Kingston’s Baby Ballet Slippers, and Shwin & Shwin’s Baby Boy Slippers. Every kid loves simple games like tic-tac-toe and checkers, and this DIY from Dana at MADE puts them together in a travel set. 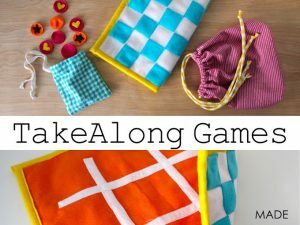 Go to the Take Along Games Tutorial. 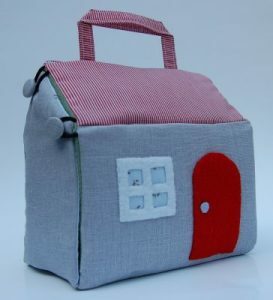 This little project has endless possibilities, you can decorate the travel fabric dollhouse however you please! Turn this into a firehouse, a farm, or a pretty pink princess castle by changing your color selections or adding different trims and design elements. Find the how-to and pattern at UK Lass’s Fabric Dollhouse Tutorial. Other favorite fun and games gifts to make include Amber’s Coloring Book & Crayon Tote, Kate’s Printable Sewing Cards, Angela’s Owl Tag Along Backpack, Sew Much Ado’s Felt Flash Cards/Memory Game, and Melissa’s super cute Ruby Lou Bag. We just love Layla the elephant, who wouldn’t love cuddling up with this softie? 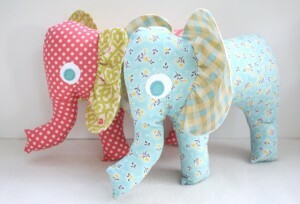 Use different fabrics to change the personality of your elephant, and to make a custom cuddly for any boy or girl. Get the how-to and pattern from Jess’s Layle Elephant Softie DIY. Not all monsters are scary, this one is all heart. We think this little guy would make the perfect stocking stuffer! 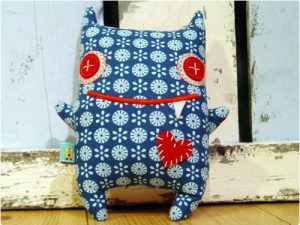 Click to get the How To Sew a Revoluzzzionary Monster Tutorial and Pattern. More cuddly critters to stitch up for kids are a Plush Fox Doll from A Beautiful Mess, a Sock Monkey from Stacy Schlyer (remember, the funkier the socks, the funkier the monkey! ), and Hootie the Green Owl from New Green Mama. Looking for even MORE handmade gift inspiration for kids? Visit our WeAllSew.com Pinterest Boards; Sew for Little People, Oh Baby!, Back to School, and even Stitch it Quick!. Previous Previous post: Nearly 250 Christmas Boots!